You may have already heard about dark dining, a phenomenon that’s hitting bigger cities in the US such as New York and San Diego. Dark dining restaurants have cropped up in cities around the world, offering themselves up as a unique attraction to tourists and a fun date night for locals. The idea behind it is that with sight taken away, the senses that accompany eating, such as taste and smell, are heightened. Many of these pitch black restaurants offer five-star meals with vibrant flavors, while other restaurants offer dark dining for the fear factor. In Montreal, the best dark dining restaurant is said to be O’Noir, the first one to open up in Canada. I decided to dine at the restaurant with my boyfriend and another couple, and the experience was one I’ll never forget. The only photo I have posted of the restaurant is off the lobby because that was the only lit place in the building, where you select your food ahead of time. The other couple I was with took full advantage of the vegan and vegetarian menus, while we chose from the regular menu. For each course at O’Noir, you can opt to have one of the menu items or a surprise item. So I opted to have the surprise appetizer and dessert, while my boyfriend chose a surprise for his entrée, and we shared. Another cool thing about these restaurants is that they serve a greater purpose than just heightening your dining experience. Dark dining restaurants are also huge employers for blind people. 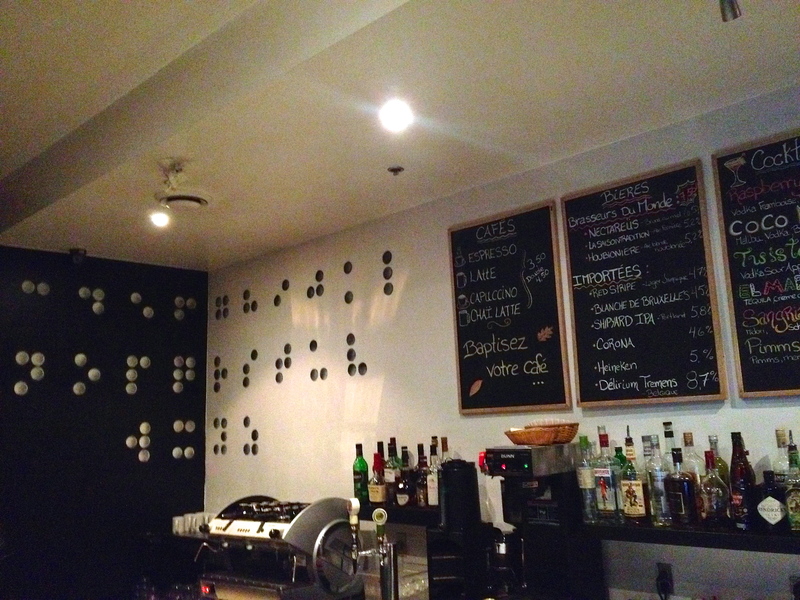 In a city with 70% employment rate, O’Noir hires all blind staff and donates a portion of their profits to local groups that assist blind and visually-impaired persons. When we asked our waiter how long it took to train for his job, he told us only 7 hours. We were pretty astounded by that fact, and maybe after reading the rest of this post, you’ll understand why. When our waiter came to collect us from the lobby, we all had to put our hands on each other’s shoulders like a line dance. Then we were taken into a room that I think was very big, but it was pitch black so there was no way of knowing, with muffled conversations going on everywhere. I could feel waiters passing me with dishes, but miraculously, no one ran into each other. Our waiter took us to the bathrooms first, which thankfully were lit. When we came out of the bathroom, our waiter was gone for several minutes. We didn’t know what to do, staring down the dark hallway for so long that we actually started wondering if one of us should venture in to find him – which would have obviously been a disaster. Finally, our waiter emerged out of the darkness with another group who had to use the bathroom. It was in this moment that I got accidentally, but full-throttle punched in the face. Not much else to say about that. As we were heading to our table, I started to get nervous that this would all be too much. I had the sense that our eyes weren’t going to adjust to this darkness well enough to see anything – and this turned out to be true. However, they set up the restaurant so that you didn’t feel anxious at all. Other tables were, I could tell, spaced out decently well so that conversations could barely be overheard. The muffled noise made it all bearable, while having space to knock my elbows around a bit helped as well. Speaking of which, how did we not knock anything over? They had a very calculated system of serving us. Any drink or plate they brought to our table would be touched to our outside shoulder, where we would take it and place it in its respective spot. The drinks were all supposed to go on the inside corner of the table, preventing anyone from spilling over the side of the table. Being a clumsy person, I was convinced I’d spill at least one thing, but I didn’t! The food was delicious, especially the surprises. At the end of every surprise dish, we were asked to guess what we ate, then we were told what it actually was. We all guessed wrong on every surprise dish – so much for heightening our senses. I thought my dessert was some type of vanilla pudding and it turned out to be a lemon merengue pie. It was sooooo good though. As for the dining experience, it was pretty interesting. You could tell after a while that nothing was very fancy in this dining room – probably because it doesn’t have to be. About 5 minutes into the meal, I stopped caring about my posture and other factors of dining etiquette that I had never even noticed I engage in. The food was so good that, at the end of it, we all admitted to having wiped our plates clean with our hands since no one could see. I regret nothing. If you ever find yourself in Montreal and want to have a dark dining experience, I definitely recommend O’Noir. It sounds like it’ll be an anxiety attack at first, but I think you’ll find it surprisingly comfortable.